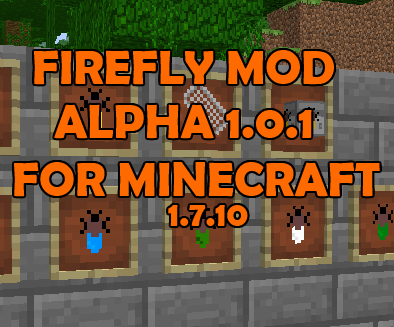 Welcome to the official MCreator topic for "Firefly Mod Alpha 1.0.1"
A technical mod made with MCreator and some java editing. Farm blocks and ores can be difficult. This mod adds more then 22 fireflies. Fireflies have the ability to change to a block or an item. To get those fireflies, simply go to a biome and use your Firefly Net to catch them. Once you have a firefly, you can right click it on the Worker, a new machine. This machine will transform your firefly into an item or a block. bad block/item or you might have a Rare firefly, which will give you a good item/block! The most common firefly is the "Firefly". You can find this firefly in almost any biome. But, if you're lucky, you can find Rare Fireflies, like the "Diamond Firefly"
To see all the existing fireflies, open the Firefly Mod tab. There's also a new ore, the "Glowing Ore", that drops "Glowing Nuggets". You can use glowing nuggets for the new machine, "Worker". The main item you must craft to get started is the Firefly Net. Simply right click your firefly on the "Worker". I will give you a block or an item. You will find what block/item you will get in this topic. Here's the list of the common fireflies and the biome where you can get them. Now try to find rare fireflies! Write in the comments any idea for new Fireflies or new machines or write bugs. Thanks for downloading and playing with Fireflies. Nice mod with nice description! Keep up the good work! Nice... I Will Take A Look And If I Like I Make A Mod Showcase And Tell PopularMMOS and DanTDM To Take A Look To The Mod! Maby you can make a machine to breed fireflies! Once the baby grows up, you can use it in the machine. But it must take some time for the baby to grow, and you can only breed 3 times with each firefly. I hope you like my idea! @#5 I Mean This Works With 1.7.2 But The Worker Is Right Clicked It Crashes!